OUR FOOD 4 KIDS BACKPACK PROGRAM - Please help us. San Diego TFC (The Filipino Company) Lions Club was chartered July 7, 2009 - The newest Lions Club in District 4-L6 this Lion Year (2009 - 2010) under the leadership of District Governor Julie Crawford. Our sponsoring clubs are San Diego Majestic and San Diego Classic. 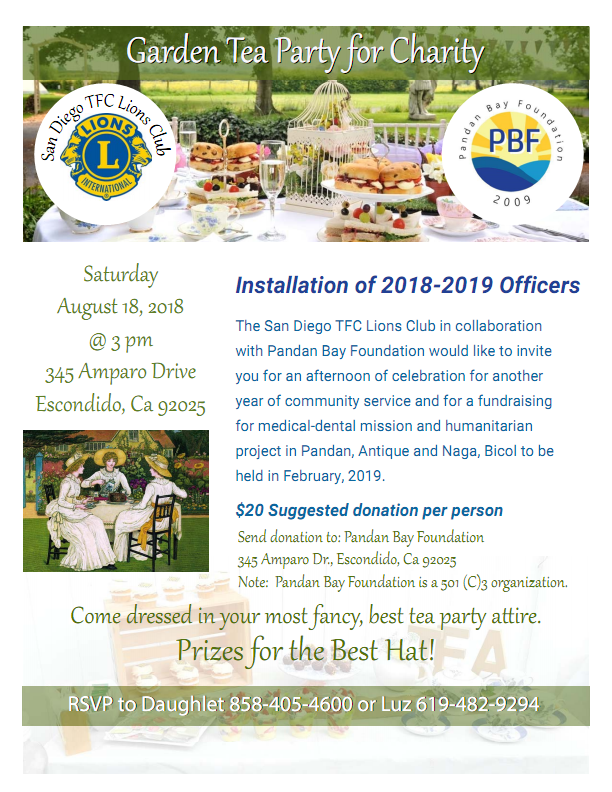 When chartered, San Diego TFC is one of the 60 Lions Clubs in District 4-L6. Our members come from many different professions - from MD's to RN's & JD's, MBA's to Engineers, Accountants to Bank Managers, from Real Estate to Retired Military personnel (Chief Petty Officers to Colonel) and from Carpenters to Electricians. We are so proud of our dedicated members and we are here "To Serve" our local community and communities abroad. "TFC", The Filipino Channel, is a moniker for the ABS-CBN Global TV Network from the Philippines that intended to connect Filipinos, living and/or working overseas, to their country of origin. Ear catching and very popular, it was adopted by the club, but instead, to mean "The Filipino Company". It aimed to invite those who have affiliations, attachments and connections to the Filipinos to join the club; and aside from fellowship, partnership and networking, serve their local communities and also serve across the seas. The club logo depicts a "jeepney", a form of public transportation that is prominent and popular in the Philippines. It is inside a round frame to signify the club's unending commitment to Lionism and dedication to service. The text colors represent the same colors (red, green and blue) of the TFC ABS-CBN Global network, the inspiration for the club's distinguishing name. Lions are an international network of over 1.4 million men and women in 214 countries and geographic areas who work together to answer the needs that challenge communities around the world. As of June 30, 2017 Lions Clubs International had 1,425,795 members, 47,390 Clubs, 755 Districts in 210 countries and geographic areas.